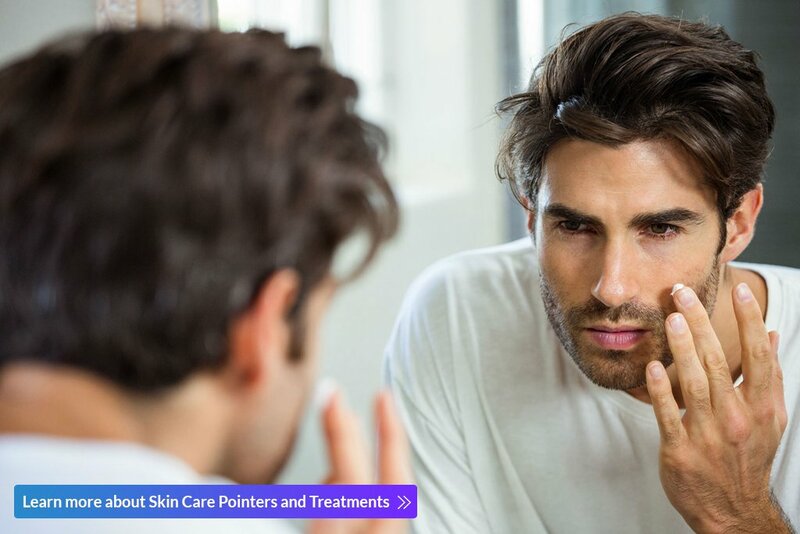 While it is common for most men to keep their skin care regimen limited to shaving, there are also those who are now investing more time in taking care of their skin. If you belong to the latter group of guys, there is no need to be embarrassed. After all, doing so could reward you with healthier and younger-looking skin that can make you look and feel good. Women are not the only ones who can benefit from wearing a sunscreen SPF. To prevent skin damage and aging due to sun exposure, apply a sunscreen whenever going outdoors. For superior protection choose an oil-free and mineral sunscreen with an SPF 30 or higher such as Clear Defense SPF 45. Also, try to find a broad-spectrum sunscreen that can protect you from UVA and UVB rays which causes premature aging. Other means of sun protection include wearing sunglasses, seeking shade, and wearing protective clothing. When it comes to cleaning your face, you need to do it every morning and evening as well as after working out. It is best to ditch regular bar soaps that usually contain harsh ingredients which can dry your skin. Instead, use a mild and gentle facial cleanser that suits your skin type and wash your face with lukewarm water. If have been struggling with acne, consider a clay-type of cleanser that can gently clean the pores and reduces redness while preventing future breakouts. Purifying AZA Cleanser contains effective bacteria-fighting and pore-cleansing ingredients such as kaolin clay, biosulfur and azelaic acid. Moisturizers work by trapping water or locking in moisture in your skin, which is beneficial in reducing the appearance of fine lines and wrinkles. Moisturizing daily can also make your skin look healthy and youthful. It is recommended to apply the product immediately after bathing or showering when the skin is still damp. If you always suffer from razor burns and bumps or ingrown hair, it is better to rethink your shaving routine or better yet, consider safe hair removal treatments for men. Cutis Laser Clinics in Singapore offers three body and facial hair removal devices that are suitable for all skin types. Laser Hair Removal. This gets rid of unwanted hair using pulses of light. Laser hair removal works by destroying the hair follicle, which then leads to permanent hair reduction. Cutera CoolGlide Laser Hair Removal from Cutis Laser Clinics is suitable for the majority of skin tone, including darker skin type. LHE (Light and Heat Energy) Removal Technology. This is an efficient way of removing unwanted hair without causing damage to the surrounding skin. LHE technology works by using heat and light energy to target hair follicles. It is ideal for large areas of concern like the back. Suitable for medium to fair as well as sensitive skin types. Prowave IPL Hair Removal. This is an FDA-approved hair removal system that uses a tailored light source for disabling the growth of hair follicles and reducing hair permanently. This can also safely and quickly treat large areas like men’s back and chest. IPL is also suitable for fair skin types. If you starting to notice the effects of gravity on your face with fine lines and wrinkles around the eyes and mouth, you can turn to injectables (Botulinum Toxin and dermal fillers) and Ultherapy to give you a youthful and refreshed appearance. Botulinum Toxin (or “Brotox). This works by temporarily blocking the nerve signals that causes muscle contraction, which then creates wrinkles. This makes Botulinum Toxin best for correcting frown, forehead, and smile line. A Botulinum Toxin injection can also be used in correcting droopy eyelid and lines around the lips and neck. Dermal filler. This skin tightening treatment is effective in restoring the skin’s elasticity and youthfulness. Dermal fillers are ideal for reducing fine lines, giving a chiseled jawline, defining the chin, reducing dark circles and under eye bags, as well as enhancing the cheekbones. At Cutis Laser Clinics in Singapore, we offer different types of fillers that can give you a rested look. A consultation with our aesthetic doctor, Dr. Sylvia Ramirez, will let you know which type of filler is right for you. As you may know, collagen is responsible in making your skin look younger, plumper and firmer. Over time, our skin loses collagen which result to sagging skin and folds along the nose and mouth. To lift and tighten your skin, you may consider safe non-invasive collagen-building procedures such as Ultherapy, Exilis Ultra and Titan. Ultherapy is a FDA-cleared and European CE-marked non-invasive lifting procedure that uses time-tested ultrasound energy to target deeper layers of the skin stimulating new collagen and resulting to a naturally lifted appearance. Ultherapy in Singapore is proven to lift the skin on the brow, under the chin, and on the neck, and improve the appearance of fine lines and wrinkles on the face. On the other hand, Exilis Ultra is an FDA-cleared procedure that combines radiofrequency and ultrasound wave to stimulate collagen production resulting to tighter and firmer skin on the face and body. What’s unique with Exilis is that it can also be used for body contouring and fat reduction without surgery or downtime. Lastly, them Cutera Titan utilizes an FDA-cleared infrared laser-light technology to heat the dermis well below the skin’s surface. This heating can cause immediate collagen contraction resulting to tighter skin. After the procedure, new collagen growth results in further tightening with the improvement of lax skin, folds, and lines. Staying healthy and looking good should be more than just about working out and eating right. It is also important to take care of your skin, which is essential for looking healthy and confident. Keep in mind that it won’t really matter how stylish your clothes are if you don’t take good care of your skin. Contact Cutis Laser Clinics today and schedule a consultation with our Harvard-trained aesthetic doctor, Dr. Sylvia Ramirez, to find out more about the products and treatments that can help you achieve better-looking skin.